Everyone has heard of Dale Carnegie and his New York Times bestseller, How to Win Friends and Influence People. In fact, people are still reading this book. Although it was first published in 1936, it is remains listed in the top 20 business books on Amazon and has sold over 15 million copies. It has been popular with both men and women who would like to emulate the habits of highly effective people. Readers are attracted to books by successful people who offer thought-provoking ideas, life lessons or ways to grow rich. There are many well-known authors of advice including, Tony Robbins, Eckhart Tolle, Jen Sincero, Paulo Coelho, Deepak Chopra and Wayne Dyer. Brené Brown is another, and her TED talk, The Power of Vulnerability, is one of the five most viewed TED talks in the world. More recently, Rachel Hollis has topped the Amazon book list with her powerful book, Girl, Wash Your Face: Stop Believing the Lies. In this genre, a great book is often one that emphasises the power of positive thinking, eliminating negative thoughts or tackles social problems and encourages new social movements. More broadly, unlike fiction books, personal development books investigate a problem and offer a solution. For authors today, it is an ideal category to consider. We are all experts in some way, so we possess advice that may help people. The biggest advantage of publishing advice and personal development books is discoverability on Amazon Search as well as Internet search on Google and Bing. Unlike fiction, the themes of these books are very easy to define. Because of this, they are ideal for using SEO to aid in being indexed by major search engines. Fiction discoverability is more or less confined to individual online retailer searches on stores such as Amazon, Apple iBooks or Barnes & Noble. Non-fiction, and particularly self-improvement and advice titles have huge potential for being found on websites, social media, blogs and by Bing or Google search. To take a simple example, let’s say you write an ebook about golf, and the title is How To Improve Your Golf Swing. Doing a Google search on the title will bring up a lot of results. But scroll down to the bottom of the first search page and you will find SEO gold. Google will list other popular search terms that you can use on your website and ebook retailers in the form of longtail keywords. Here is the list Google suggested. How do I improve my golf swing, golf swing basics, compact golf swing, golf swing technique, good golf swing tips, proper golf swing, correct golf swing, how to get the perfect golf swing. Adding these longtail keywords when publishing on Amazon, Smashwords or Draft2Digital, as well as incorporating them into websites, blogs and social media posts will help dramatically in attracting highly focused traffic, and potential ebook buyers. For fiction, this use of SEO to attract ebook buyers is not nearly so easy. As an example, I’ll invent a romantic title. I Left My Heart In Rio. Entering this title into Google returns no longtail keyword suggestions at all, and most of the indexed entries are for songs and YouTube videos. The best chance of discoverability for fiction comes with hunting down theme-specific keywords and categories when publishing. Another advantage is that these books fulfil the number one use of the Internet, which is to answer a question. From the example, I used above about golf swing, when someone uses Google or Bing to ask a question such as, “how can I improve my golf swing?”, search engines do not differentiate between a question and a phrase. So, how to improve your golf swing and how can I improve my golf swing, are seen as almost one and the same. On top of this, the longtail keywords that Google suggest will help in returning results for similar or related questions. This also works on ebook retailers, as the search function on their sites work in a similar fashion. If you know exactly what people are searching for, it makes selling books much easier. You can spend a few hours doing your research on Google and Amazon search and hoping your selections work. But there is a better, faster and more accurate way to get the best keywords and categories for your books. My example earlier of golf swing is probably not the most popular topic on Amazon Books. 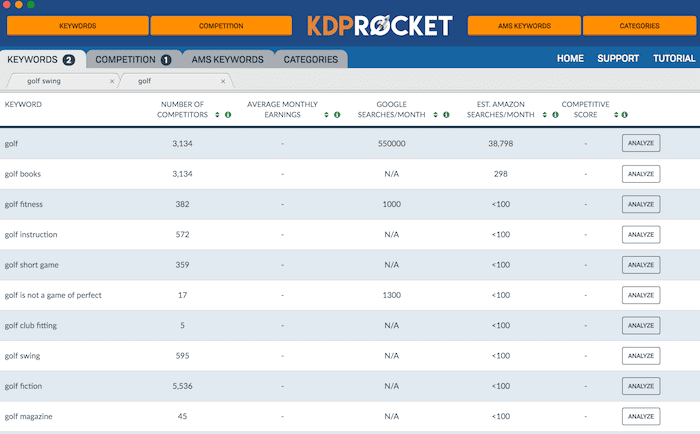 But let’s look at what real-time book data on Amazon reveals by using KDP Rocket to search the Amazon database. Obviously, golf and golf books are good keywords with nearly 40,000 searches a month on Amazon. But with a little more digging, I am sure you could find more keywords. It is interesting that only one category is recording sales today. So that must be the first choice. Now, this is very interesting. There is a book with golf swing in the title, and it is making just over $1,000 per month. 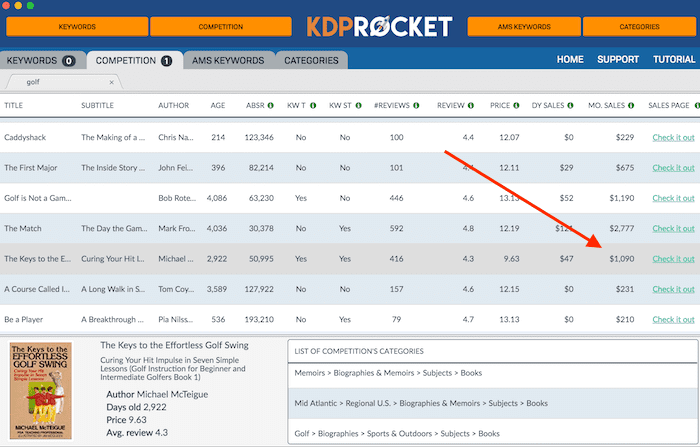 With this information, I could put my example book in the same categories and experiment with a few more keywords to help get sales from people searching Amazon for books on golf. Accessing the Amazon database takes out all the guesswork. If you are publishing to make money, using real-time data and being able to dig into competitive titles is a huge advantage for you. While there is often a lot more research needed when writing how-to and advice books, they do tend to be much shorter than fiction. Commonly, these rarely run beyond 35,000 words. So not only are they faster to write, but they are also quicker to edit and proofread. 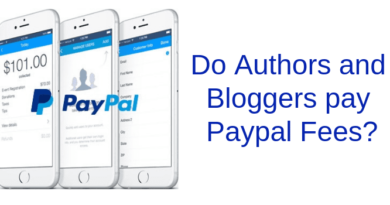 While non-fiction writing is not for everyone, there are distinct advantages for self-publishers who have expertise or experience in niche market sectors to self-publish personal development and advice ebooks. All you need to do to succeed is write a great book, and then use SEO and Amazon data to help you attract book buyers. If a book on golf swing is making $1,000 a month, what is your self-help subject’s selling potential?